I received a really fun package in the mail this week. About a month ago I entered a giveaway on a wonderful blog called Raw Epicurean. The post was about Bay Leaf and at the end you could enter to win products from Mountain Rose Herbs that centered around the Bay Leaf. By the way, I love this blog. It has great raw recipes and monthly talks about herbs in detail. Those of you who read regularly know that my love of herbs is seconded only by my love of learning about herbs. Anyway, oddly enough I won the giveaway and this week I received a fun little package from Mountain Rose Herbs with all things Bay Leaf. (Don't you just love the smell of bay leaf, it's just so refreshing!) 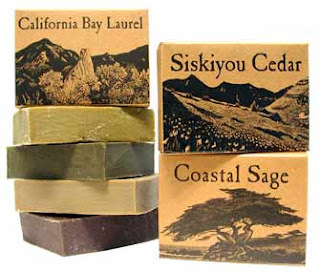 I received a very generous bag of bay leaf, bay laurel essential oil and this great bar of organic soap scented with bay leaf. I love all my new treasures and the kids can't get enough of washing their hands with the new soap. Here are some interesting facts about Bay Leaf and ways to use it. It is the source of crowns and wreaths for heroes. Our term baccalaureate is probably derived from this practice of placing a wreath of laurel leaves on someone to bestow honor. 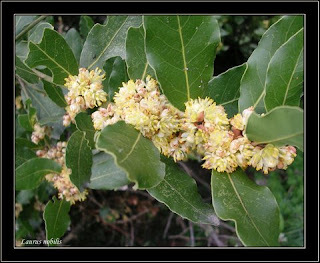 Romans considered the bay tree the best protection from thunderstorms and Nero in particular thought that bay trees purified "vapors" thought to cause disease. He wasn't entirely wrong as bay leaves possess a strong antiseptic quality. Bay oil was very also very popular with the Romans who thought Bay was a symbol of wisdom, peace and protection. An oil of bay leaf can be used externally for sprains and bruises; and dropped into the ears to relieve earaches. A tea of bay leaf can be used to promote digestion, create an appetite, or to stimulate menstruation. (Good to know - I will not be drinking any teas of this wonderful herb until after my pregnancy as it is a known abortifacient). Bay leaves are mildly narcotic, anesthetic, antibacterial, anti fungal, antimicrobial, antiseptic, and sedative. Great for colds and flu and getting some rest. Bay leaves have also been used to increase insulin sensitivity, lower blood sugars and retard weight gain. Don't forget about the Bay Leaf's wonderful uses in cooking. A few bay leaves can be added to any soup, stew or casserole giving it a wonderful flavor. The bay leaf is a part of the flavorful blend of Bouquet Garni where it comes together with parsley and thyme to flavor soups, stews and sauces in traditional French, Moroccan, and Turkish dishes. Check out Raw Epicureans post on this wonderful herb for more culinary ideas.